To keep Nathaniel entertained this morning while I jumped into the shower, mama broke out the big guns... the toys that came with his bouncer! 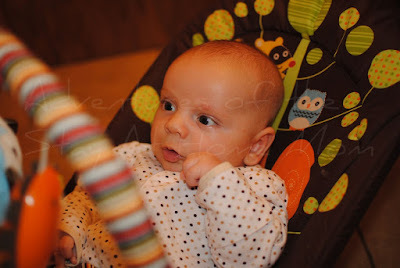 When I first attached the toys onto the bouncer, the look on my little boy's face was a combination of YOU'VE BEEN HOLDING OUT ON ME, WOMAN and OH MY GOSH! IT'S AN OWL! A FREAKING OWL! AND WHAT'S THIS?! A HEDGEHOG?! Incidentally, who puts a hedgehog on a child's toy? What ever happened to little teddy bears? What possibly possessed the Fisher Price marketing department to put a hedgehog on a bouncer? ...Because in two years, my little boy's favorite animal will be a hedgehog. lol. freaking hilarious. And oh so true! Hedgehogs rock. The first animal Turtle really showed a preference for? The peacock. Followed by the walrus. Go figure. Lizzy has the pink version of this bouncer, and LOVES it. She is totally fascinated by the flowers! Garrett loves to stare at the hedgehog and owl too! He doesn't seem to care much about the squirrel.